Nature tourism is considered the most interesting part of a vacation, as travelers can get closer to nature and feel the peaceful atmosphere. Not to mention the options are many, including Ponggi Waterfall located in Southeast Sulawesi Province. To be exact, the location is in Ponggi Village, Purehu District. Most of the visitors come to this tourist spot to play in the water and feel the peaceful nuance. That means it is a great spot for relaxation and enjoying the fresh water, which is suitable for everyone. The main feature in Ponggi Waterfall is the serene atmosphere, as it is surrounded by a thick forest and a rocky landscape. The height is moderate and the water is refreshing. You can even find a small pond, from where you can take a bath and get in. Have no worries, as the pond is quite shallow and the kids can enjoy it as well. The color of the water is blue and it emits crystal clear appearance. No wonder, many tourists would be mesmerized by such beauty. North Kolaka Regency should be proud of Ponggi Waterfall, as it attracts many tourists over time. The clear water and refreshing atmosphere make it everyone’s favorite spot to relax. There is even fog in the morning, so the nuance is quite chilling. If you get lucky, you may see a rainbow as well. Apart from these excellent conditions, there are other reasons why people keep coming to this location. For example, they want to learn the history of the waterfall. The real name is Ponggi Serambu, actually. Ponggi was a name of a person and Serambu means “smoke”. 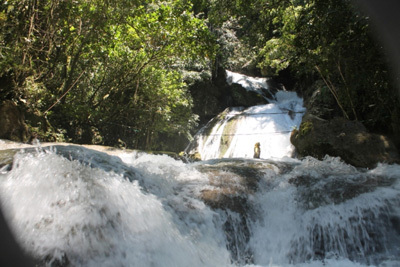 It is considered easy to reach Ponggi Waterfall regardless of the location of the visitors. Despite a long trip, tourists won’t regret visiting the waterfall. The locals, Tator People, may help any visitors to get to the waterfall, as well. Thanks to their friendliness, tourists won’t experience hard times there. Not to mention it gives an opportunity for trekking, as the location is surrounded by a thick forest. Have no worries, as the route is easy. Tourists can even hire a tour guide to get around the waterfall! The locals have built a gazebo near to Ponggi Waterfall, which is comfortable for relaxation. In this case, make sure to carry some snacks and drinks so you can enjoy a good nuance while eating foods with your families. Both the refreshing atmosphere and a stunning panorama of this location never disappoint everyone. In order to get to Ponggi Waterfall, you need head to Southeast Sulawesi Province first. For those who come from Jakarta, it requires a flight to Haluoleo Airport, which is located in Kendari City. From there, take a local transportation service to Purehu District and your last destination will be Ponggi Village. It only takes 2-3 hours from Kendari City, actually. Once you get to the village, you need to walk to the location. Have no worries, as it only takes a few minutes.